I love the cover of this book. It really conveys well the premise of this book. Nigel Cain, a wealthy entrepreneur, figures a way to bring water in the form of a massive man-made iceberg from the arctic to countries in need. He invites Gabriel Pike, an engineer from a small firm to give the final safety approval to bring this first gigantic iceberg, replete with a 5-star hotel and casino built atop it, into New York's harbour. Cain is a showman and he uses the media and Pike's skills to his advantage. Pike goes from being a regular forty-something guy, with no wife or girlfriend, to a media sensation overnight with several women vying for his attention. Pike enjoys the attention and luxurious life-style on the iceberg until a storm hits them and he uncovers things are not what they seem. But that's only the beginning of what turns out to be a conspiracy of massive and destructive proportions. Pike now has to figure out how to save himself and avoid major disaster. 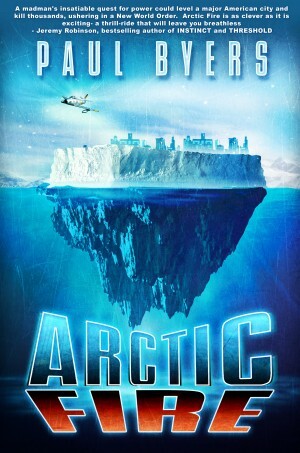 I enjoyed reading Arctic Fire and found the plot to be original and Pike's character really likable. I was so impressed with the author's imagination and the scope of his vision and creativity when it came to the iceberg and how it was built and its functionality. This, along with the villain's wild secret plan, and Pike's quick wit made the story provocative and exciting without gore and freakish psychopathy. The reader is kept guessing and never quite certain what the real problem is with the iceberg and how the whole venture will end. I liked that. The beginning caught my attention, linking the night the Titanic sank with the present-day story. We are then introduced to Pike, showing off his piloting skills with his F-56 Sabre plane. There is a lot of action in this novel, but some of it is bogged down with scenes that could have been cut short or eliminated, like the ones with the women that were kind of soap-operatic or when we are introduced to all the detailed mechanics of the iceberg and a slew of other characters that could have taken less space. I would have liked for K.D. 's character to have been better developed. Mallory, Cain's executive assistant, was an interesting character. I was trying to figure her out throughout the novel. There was a scene where Pike saves her, and I just wondered why the author included that scene, since I was waiting for a time when that would have something to do with the plot, but it didn't. Also, better editing was needed as I found lots of typos and punctuation errors. But apart from all this, I really did like this novel. The real suspense for me began during the last third of the book. There were twists and turns, and I began turning the pages faster to see how Pike would get out of one dangerous situation after another. The ending was really good and satisfying, and it left me speculating if a sequel would follow. I would certainly read the next book if there was one. I found this to be an ambitious novel with a great original plot that stirred one's imagination and questioned the possibilities regarding our water resource and its future. Disclosure: Thanks to author for sending me this book for review. I was not compensated in any other way, nor told how to rate or review this product.